Give me all the coffee! Oh and coconut, just make it an Iced Toasted Coconut Caramel Macchiato please! 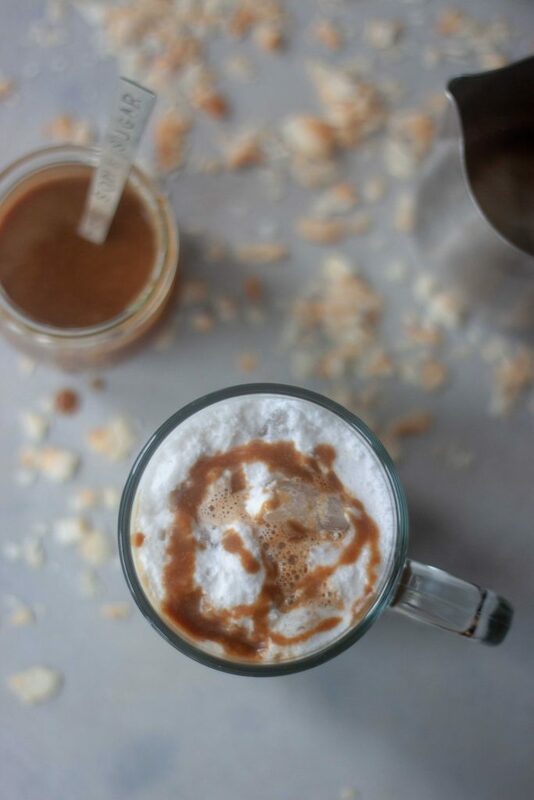 Any coffee and coconut fans out there? I’m not usually a big sweet coffee drinker but I have my moments and when I do I fully enjoy the sugar filled drink even though I get a venti for the extra shot of espresso, extra ice, grande amount of coconut milk, and half the syrup/caramel. It’s sweet enough for me but when given the option would much rather make them at home. Although at home it’s usually an Americano, Iced Americano, or straight shots of espresso. I do make cold brew in the summer too. Pre workout I do like an Iced Nana Latte or fav REBBL Cold Brew (which I also take on the go when I’m running around vs coffee shops but I’m pretty much and equal opportunity coffee drinker, well good coffee). Last week I shared my Toasted Coconut Milk and mentioned I had recipes coming and this is one of them! 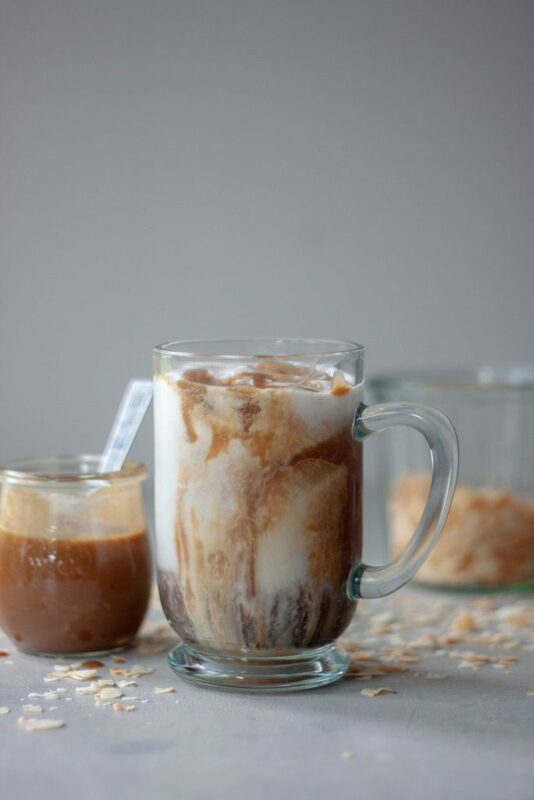 Yes real toasted coconut flavor in this Iced Toasted Coconut Caramel Macchiato and real homemade caramel sauce. Worth making the caramel sauce because it’s not hard and it’s so good on ice cream too, just saying. I shared 2 versions of Toasted Coconut Milk as well as a super simple version to blend already toasted coconut. If you don’t want to make a whole batch just blend 3/4 cup of coconut milk with 1-2 tablespoons of toasted coconut (I use pre toasted Bare Snacks when making 1 cup in a pinch). 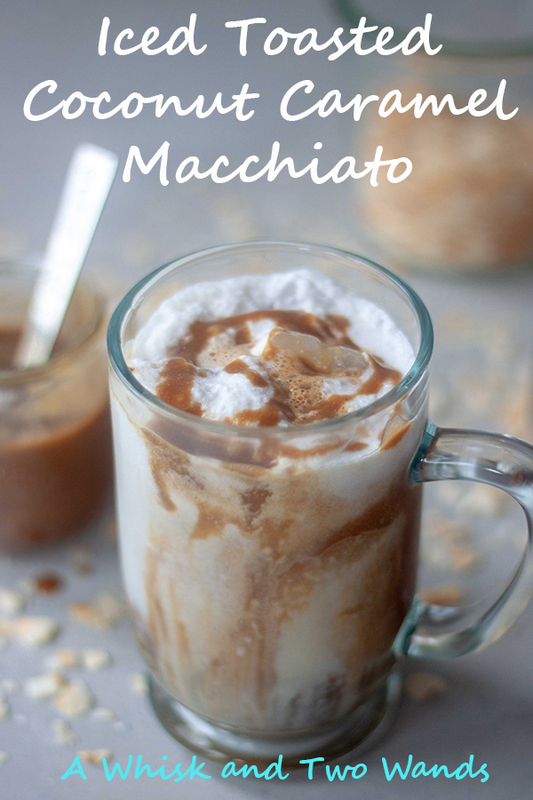 This is a version like the one in the recipe using water but using a 30 calorie unsweetened coconut milk makes it a little richer. If using the unstrained version, shown in photos, you will have a nice thick cream on top too! I’ll have one of these in hand tomorrow as I rush to relax. You know where you run around like crazy getting everything done and packing so you can relax. Seems like we were just doing this and I just finally got caught up with everything from being gone and we’re leaving again. Such is summer and wouldn’t change it. We actually were going to be gone a lot more this summer but with S’s soccer schedule and tryouts for club and high school I’ll be staying back with the girls instead of seeing the world and traveling. Which means more coffee as those weeks will be CRAZY! Even with the holiday and travel I’ll still have a post Monday for Meatless Monday. It will be the only post next week on the blog but I’ll have more recipes and inspiration posting over on Instagram. Oh and there’s a giveaway going on this week that closes tomorrow, go check it out! I have so many recipes in que that I cannot wait to share with you but time being tight and so many favorites if you want to see a certain type of recipe or more of something let me know as chances are I have one and will move that to the top of the list! Rich, creamy, nutty, and a little toasty Toasted Coconut Milk, buttery sweet (vegan) caramel, layered with espresso and served over ice brings this Iced Toasted Coconut Caramel Macchiato to the next level! Drizzle inside of the glass with half of the caramel sauce. Add coconut milk and ice. 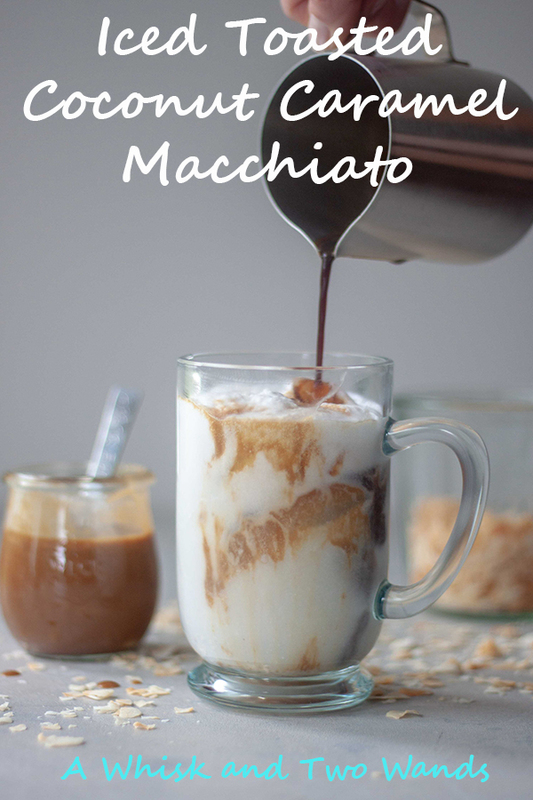 Slowly pour espresso over top and drizzle with remaining caramel sauce. Rich and velvety dairy free (vegan) caramel sauce made with just a few simple ingredients. In a medium sauce pan, over medium heat, whisk all ingredients together (except vanilla) until combined and bring to a simmer. Once simmering, whisk and reduce heat to low. Simmer, maintaining a light simmer, for 25 minutes without stirring. After 25 minutes whisk, making sure to scrape the bottom and sides of the pan for any darkened caramel. Continue to simmer for 25-35 minutes until desired thickness is achieved, stirring every few minutes, being sure to scrape the bottom and sides. Remember it will thicken some once it cools. Once desired thickness is reached remove from heat. Let cool for 5-10 minutes and whisk once again to ensure caramel is smooth. Once cooled, transfer to a glass jar or airtight container and store in the refrigerator until ready to use (within a week).